The story behind the story of The Journey is remarkable in itself: Award-winning translator Peter Filkins discovered an obscure German novel in a Harvard Square bookstore and, reading it, realized that it was a treasure unavailable to English speakers. It was the most powerful book by the late H. G. Adler, a survivor of Theresienstadt and Auschwitz, a writer whose work had been praised by authors from Elias Canetti to Heinrich Böll and yet remained unknown to international audiences. 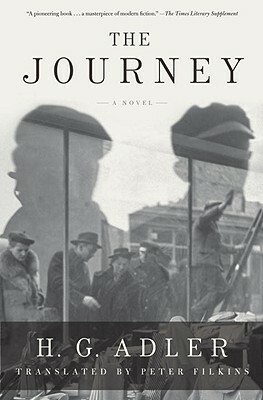 Written in 1950 after Adler’s emigration to England, The Journey was not released in Germany until 1962. After the war, larger publishing houses stayed away from novels about the Holocaust, feeling that the tragedy could not be fictionalized and that any metaphorical interpretation was obscene. Only a small publisher was in those days willing to take on The Journey. Linked by its innovative style to the work of James Joyce and Virginia Woolf, The Journey is as much a revelation as other recent discoveries on the subject as the works of W. G. Sebald and Irène Némirovsky’s Suite Francaise. It is a book proving that art can portray the unimaginable and expand people’s perceptions of it, a work anyone interested in recent history and modern literature must read.